The results shown here illustrate the importance of having an accurate knowledge of the wind resource. A high-quality site wind speed measurement campaign is therefore of crucial importance in reducing the uncertainty in the predicted energy production of a proposed project. The goal for a wind measurement campaign is to provide information to allow the best possible estimate of the energy on the site to be provided. The question of how many masts to use and how tall they should be then arises. For a small wind farm site, it is likely that one meteorological mast is sufficient to provide an accurate assessment of the wind resource at the site. For medium wind farms, say in excess of 20 MW, located in complex terrain, it is likely that more than one mast will be required to give an adequate definition of the wind resource across the site. For large projects of around 100 MW, located in complex terrain, it is particularly important to take great care in 'designing' a monitoring campaign to record the necessary data for a robust analysis in a cost-effective way. In simple terrain, where there is already a lot of experience and close neighbouring wind farms, the performance of these wind farms can be used instead of a measurement campaign. North Germany and Denmark are obvious examples. A great many turbines have been sited in this way. However, great caution must be exercised in extending this approach to more complex areas. 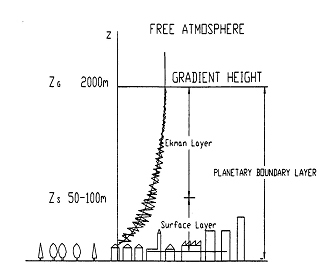 The locations and specifications of the mast or masts need to be considered on a site-specific basis, but generally, if there are significant numbers of turbines more than one kilometer from a meteorological mast in terrain that is either complex or in which there is significant forestry, it is likely that additional masts will be required. In such circumstances, discussion with the analyst responsible for assessing the wind resource at the site is recommended at an early stage. Turning now to the height of the masts, it is known that the wind speed generally increases with height, as illustrated in Figure I.2.3. Figure I.2.3 schematically shows the way in which the wind speed increases with height. This characteristic is called ‘shear’ and the shape of this curve is known as the ‘wind shear profile’. Given the discussion above about the importance of accurate wind speed measurements, it is clear that it will be important to measure the wind speed as near to the hub height of the proposed turbine as possible. If a hub height measurement is not made then it will be necessary to estimate the shear profile. This can be done, but it creates uncertainties. Commercial wind turbines typically have hub heights in the 60-120m range. The costs of meteorological masts increase with height. Tilt-up guyed masts may be used up to heights of 60 to 80m. Beyond such heights, cranes are required to install masts, which increases costs. If ‘best practice’ of a hub height mast is not followed, then a reasonable compromise is to ensure that masts are no less than 75 percent of the hub height of the turbines. A typical anemometry mast will have a number of anemometers (devices to measure wind speed) installed at different heights on the mast, and one or two wind vanes (devices to measure wind direction). These will be connected to a data logger, at the base of a mast, via screened cables. It is unusual for there to be a power supply at a prospective wind farm site, so the whole anemometry system is usually battery operated. Some systems have battery charging via a solar panel or small wind turbine. For some systems, particularly in cold climates, the measurement of the temperature is important to assist with the detection of icing of the anemometers. In such circumstances, the use of heated or ‘ice free’ anemometers is beneficial; however, their use without an external power source is usually impractical. Measurement of the air pressure at the site is desirable but often not essential. Remote sensing techniques are now being used to measure the wind speeds at wind farm sites. The technology available for this is being developed rapidly, and although the use of remote sensing devices on wind farm sites is not currently widespread, it is expected to become more widely used in the near future. Lidar (LIght Detection and Ranging), which also uses the Doppler Shift principle but emits and receives light from a laser. Sodar has been used for assessing wind farm sites for some years, particularly in the US and Germany. It is often used in combination with conventional anemometry and, historically, the results have been used to provide more information to better understand the patterns of the wind regime at a site, rather than necessarily using the data in a direct, quantitative way. Recently, some wind energy specific Sodar products have come onto the market and experience is currently being gained from these new devices. Lidar devices have made an entry into the wind market over the last few years and two main commercial models are currently widely available with additional models now entering the market. Published papers on the devices show they are capable of achieving impressive accuracy levels in simple terrain and it is expected that their use in wind energy applications will increase. The clear merit of remote sensing devices is that they do not need a mast. However, Lidar devices, in particular, are relatively expensive to purchase and both devices draw significantly more power than conventional anemometry, so for remote sites a local, off grid power supply solution would be needed. It is recommended that in-house or external experts are used to help make an informed decision about when and how to use remote sensing devices at potential wind farm sites. In recent years, it has become standard practice to download data remotely, via either modem or a satellite link. This approach has made managing large quantities of data from masts, on a range of prospective sites, significantly more efficient than manual downloading. It also has the potential to improve data coverage rates. Recommendations provided by the International Electrotechnical Committee (IEC), the International Energy Agency (IEA) and the International Network for Harmonised and Recognised Wind Energy Measurement (MEASNET) provide substantial detail on minimum technical requirements for anemometers, wind vanes and data loggers. It is strongly recommended that anyone intending to make ‘bankable’ wind measurements should refer to these documents. Historically, a notable deviation from best practice, as defined in the IEC and IEA documents, is the use of anemometers that have not been individually calibrated for the assessment of the wind resource at the site. Each sensor will have a slightly different operational characteristic, as a result of variations in manufacturing tolerances. The use of individually calibrated anemometers has a direct impact on reducing the uncertainty in the predicted wind speed at a site and is therefore to be recommended. Over the past decade, perhaps the most significant shortcoming of wind speed measurements at prospective wind farm sites has been the poor mounting arrangement of the sensors. There is an increasing body of measured data, which has demonstrated that if the separation of anemometers from the meteorological mast, booms and other sensors is not sufficient, then the wind speed recorded by the sensor is not the true wind speed. Instead, it is a wind speed that is influenced by the presence of the other objects. 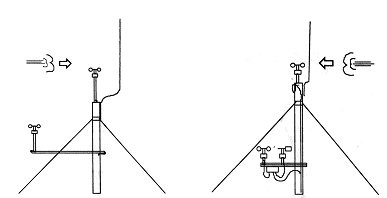 The effect of the mast structure on the flow field around the mast top is illustrated in Figure I.2.4. The figure shows that there is a complicated flow pattern, which must be accommodated when mounting the anemometry. These results have been predicted using a commercial computational fluid dynamics (CFD) code. It is important to be aware of the potential influence of the support structure on the measured data. Detailed guidance is provided in the International Energy Agency Annex XI, 1999, on specific separation distances, which are required to reduce the influence of the support structure on the measurement to acceptable levels. Illustrative examples that demonstrate good and poor mounting arrangements are presented in Figure I.2.5. If the guidance presented above is followed, a high quality set of wind data should become available, in time, from a prospective site. The absolute minimum requirement is for data to cover one year, so that any seasonal variation can be properly captured. In addition to specifying and installing appropriate equipment, vigilance is required in the regular downloading and checking of data, to ensure that high levels of data coverage are achieved. It will be necessary to demonstrate, either internally or externally, the provenance of the data on which important financial decisions are being made. Therefore, it is important to maintain accurate records regarding all aspects of the specification, calibration, installation and maintenance of the equipment used.